No matter what your business or who your target audience, Pay Per Click (PPC) advertising should always be considered as part of any marketing strategy or plan – even if it is just to have a small campaign to capture people searching for your company name! Depending on the competition, your adverts could be appearing high in the search pages catching the eyes of your potential customers and driving them to your website to complete a call to action or purchase. With a well-crafted, punchy and targeted ad, you could capture leads and convert them into paying customers – even when you’re sleeping! Pay Per Click adverts appear next to, and above, the natural search results. Potential customers then click on your ad if they’re interested. You pay for this click which sends them to your website (ideally to a well-designed and well-written landing page) where they take action. This ‘action’ may be to make a purchase, make an enquiry, fill in a form, sign up for a newsletter, download a whitepaper, or share something socially. These actions can then be set up as goals alongside your web analytics and monitored so you can see exactly how cost-effective your digital marketing is. If you think people have no time when looking at Google search page results (approximately 6-9 seconds), they have even less when they’ve clicked on your advert and are looking for something very specific. This is where most people loose money on Google Adwords (that and a poorly organised campaign). 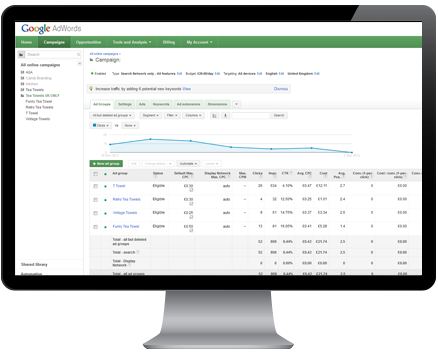 Call us on Haslemere 01428 788170 to talk about Pay Per Click advertising (Google Adwords).